Heart Handmade - Crafts, craft ideas and arts and crafts blog: Framed Objects by the. Before I set off into the wilderness (camping!!!) I wanted to share another top pick from NYIGF. Have a great weekend everyone and wish me luck! No snakes, no snakes... that's all I'm asking for. Did the shoe purchase wipe you out? I know. No probs, why not draw some inspiration and try a make your own solution. With a little imagination, I'm sure you can come up with something just as fab. Maybe purchase a couple of frames and other objects from a rummage sale, remove glass, and either staple gun or heavy-duty glue on a thin piece of wood or better yet - recycle some cardboard/box and cut it to size for the backing. 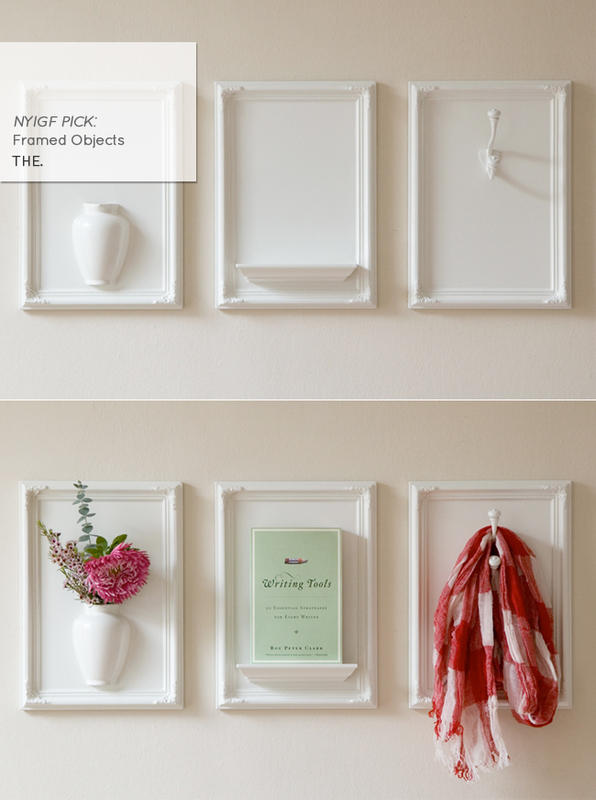 Attach display elements by sourcing a small shelf (you can always give IKEA a try if you can't find the right size), half moon vase or something similar and hooks are definitely easy to find. Spray paint it white or whichever color you like. Either way, I love this idea. Brilliant! And your diy idea is also brillaint! I love these and agree....they would be awesome to elevate everyday items to extraordinary ones! ps have a great time camping! That is awesome!! I am definitely considering some diy...;) Thanks so much for sharing! I wonder how those would look in red..or mint green..or powder blue.. hmm. absolutely love this! I'm linking to it in my google reader round up! I agree...VERY fun and inventive! What a great, simple way to feature some everyday items that might look like clutter elsewhere! Where are you going? Alex and I are trying to plan a weekend trip in September, I'd love some ideas. Agree. I love that idea too ! All ideas explained here are informatives.thnaks for shairing. This is a grea idea, love the simplicity and the fact that you can customise them any way you like.